Introduction: Pseudomyxoma peritonei presenting as appendicitis is not uncommon. However, presentation of this disease has not been described in cases with rare anatomical anomalies of the gastrointestinal tract. Method: We discuss a case of pseudomyxoma peritonei with situs inversus incompletus and intestinal malrotation presenting with acute appendicitis. Discussion: A 28 year old male presented to our emergency room with acute left upper quadrant abdominal pain. He was afebrile with no evidence of leukocytosis. His workup included a computed tomography (CT) scan which revealed situs inversus incompletus, intestinal malrotation, and inflammation in the left upper quadrant. Diagnostic laparoscopy confirmed the CT findings as well as the presence of appendicitis along with neighboring peritoneal studding. Uneventful laparoscopic appendectomy and peritoneal biopsies were performed. 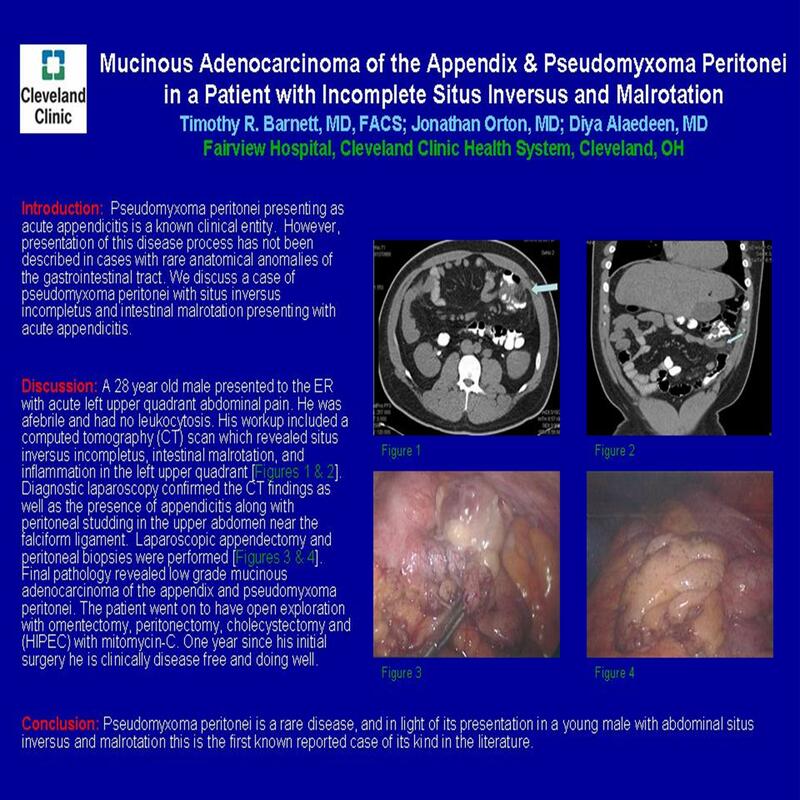 Final pathology revealed low grade mucinous adenocarcinoma of the appendix and pseudomyxoma peritonei. The patient went on to have open exploration with omentectomy, peritonectomy, cholecystectomy and heated intraperitoneal chemotherapy(HIPEC) with mitomycin-C. Six months since his initial surgery he is still alive and well. Conclusion: Pseudomyxoma perotinei is a rare disease and its presentation in a young male with situs inversus and malrotation makes this extremely uncommon. This is the first reported case of its kind in the English literature.